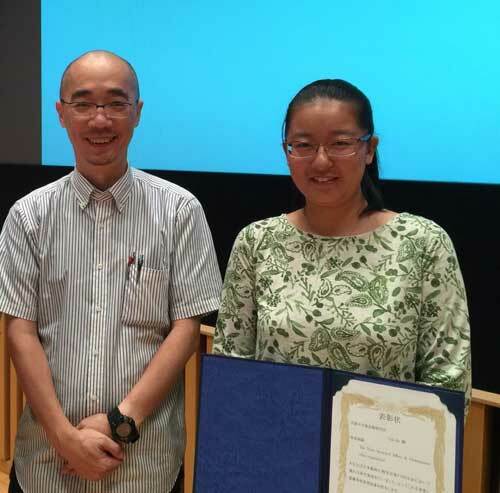 Gao Jie (Graduate student of the Language and Intelligence Section, PWS student) won the best presentation award of the Japanese Society for Animal Psychology in the "KOUDOU2017". 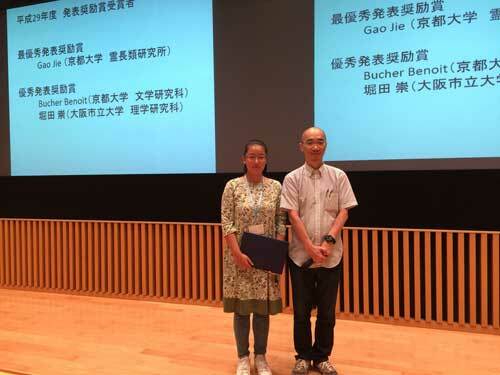 Gao Jie (Graduate student of the Language and Intelligence Section, PWS student) won the best presentation award of the Japanese Society for Animal Psychology in the "KOUDOU2017". joint annual meeting of the 5 societies held during August 30 to September 1. Animals use bodies to explore and interact with the world. Humans’ body recognition is deteriorated by inversion. This inversion effect suggests configural body processing. Little is known about this in non-human primates. We tested seven chimpanzees using upright and inverted stimuli in matching-to-sample tasks to examine the body inversion effect. Exp. 1 used chimpanzee bodies and houses. Exp. 2 used intact bodies, bodies with blurred faces, and faces with blurred bodies. Exp. 3 used intact bodies, bodies without faces, only faces, and body silhouettes. Exp. 4 used intact bodies and scrambled bodies. They showed the inversion effect to all intact body conditions, indicating configural body processing. They also showed the inversion effect to faces with blurred bodies in Exp. 2 and to silhouettes in Exp. 3, suggesting the roles of faces and body contours in the inversion effect. No inversion effect was found in scrambled bodies, suggesting that they know about typical body structures.